When Mount Saint Helen's erupted with volcanic fury on May 8, 1980, it burned over 230 square miles of land in the Pacific Northwest. So violent was the eruption that 1,300 feet was blown off the top of the mountain in the process. The swath of destruction left in its wake is unexpected. But what it yielded in the aftermath was even more surprising. When cleaning after the eruption, it was accidentally discovered that, when heated, the elements in the volcanic rock would fuse to form a rich, deep green, similar to an emerald. The process was later perfected in strict lab conditions to achieve magnificent deep green Helenite. 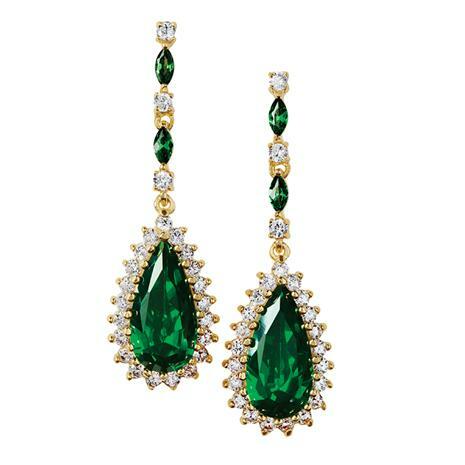 We've found the cream of the crop of Helenite and had it cut and faceted by skilled craftsmen into perfect teardrops. To enhance the beauty of this stunning miracle of nature even more, each teardrop stone is framed in sparkling DiamondAura® and set in gold-finished .925 sterling silver. These gorgeous earrings are erupting with vibrant color and fire and is certain to bring tears of joy to the lucky lady who wears them.